This year my new neighbor decided to get an early jump on the landscaping season and installed his dark brown wood mulch in early April. For the first few months everything looked just great, but then the typical spring rains followed by weeks of 90 degree sunny and something changed. My neighbor’s brown wood mulch is now just shades of grey – no curb appeal and not attractive at all. So, my neighbor leans over the fence and asks when I put down my mulch and I tell him May. His response was “oh, so that’s why it still looks good”. Here is where it gets good. I tell him I put it down May of 2012 and that’s when I get the look of how is that even possible. Even if I did not work for a company that produces rubber mulch for playgrounds and landscaping I would still use it as my yard looks great even in the winter. We don’t get much snow where I live but it does get cold and it’s nice to look out and see a hint of color amidst a sea of grays and browns. During the spring and summer is when rubber mulch really shines as with little no maintenance I don’t have to worry about replacing it, raking leaves out of it (it is heavier than wood mulch so just set your lawn blower on the lowest setting and the job takes just a few minutes) or pulling any weeds (I installed it over a premium weed fabric and have not seen a weed in years). 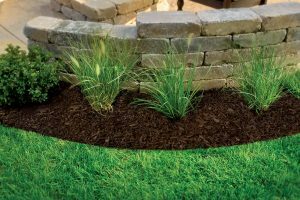 Truth be told, rubber mulch is initially more expensive than wood mulch but after just a few years you will start to see the savings add up. I have been writing these entries for more than a decade so I am familiar with the common statements that come up such as “rubber mulch offers no benefits to the soil unlike my wood mulch.” Yes, wood mulch will eventually break down over time however, what does wood mulch need to break down? The answer is nitrogen, one of the main and necessary elements needed for things to grow. So if your wood mulch is robbing your garden or landscaping of its vital nitrogen then you will have to add an additional dose a few times throughout the season. The second one is typically “recycled rubber is bad for you”. 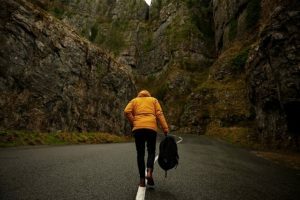 My guess is as a child you rode a bike (with rubber tires), you own a pair of athletic shoes (with rubber soles), you have been to a doctor’s office (most have rubber floors) and of yeah the big one, you have driven in a car your entire life. If rubber was a bad substance we would all be in some trouble (and would have to do a lot of walking!). 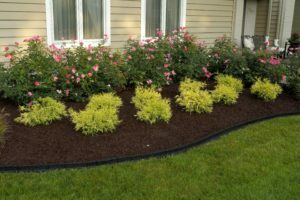 The benefits of using rubber mulch are pretty apparent as you do not have to replace it year after year. The color warranty is for 12 years and it is the safest playground surface available today. Why not give it a try and give your home some added curb appeal for years and years to come. If you need to purchase the rubber mulch in bulk give our commercial sales team a call and they can get you whatever you need.